What does cementing or re-cementing the stained glass window mean? What is cementing or re-cementing a stained glass window? After a window is assembled or leaded together, the glass is held loosely in the lead matrix. If you were to shake the lead panel, it would rattle the pieces of glass about. The leaded panel needs to be waterproofed and stiffened with a glazing cement. The glazing cement is made of a linseed oil based putty. It is used to fill in the space between the lead came and the glass. It is hand-worked into the space with a brush and a rag. Next, Portland cement, a hardener, and lampblack (carbon) is sprinkled over the panel and worked into the mixture as well. After this cementing mixture thoroughly seals the window, the leaded panel is leaned up against a wall and the excess putty is removed. Afterwards, the putty takes about two weeks to cure. Many times, when the leaded windows need re-cementing, they also need to be re-leaded. However, there are occasions that windows need re-cementing, maybe due to faulty putty or cementing mixture. To re-cement, the cementing mixture is applied to the exterior of the window, while it is vertical and in its installed position. After smearing the mixture all over the window, the excess is cleaned off. 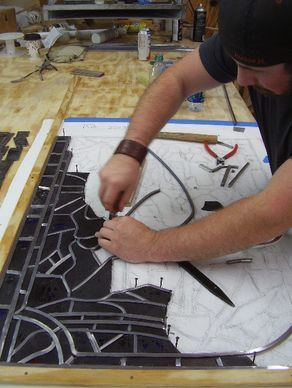 At Laws Stained Glass Studios, we rarely recommend re-cementing stained glass windows. We find that the goals of stiffening and waterproofing an old leaded window are better accomplished using other methods. If the window has protective covering, then the leaded window does not need to be waterproof. The addition of steel braces or bars will add much more strength than re-cementing. Many times the negatives of re-cementing out weigh the positives, especially when the job is not thoroughly done. Ideally, the cementing mixture seeps underneath the lead came's flanges, but much of the time, it only butts up against the lead. This can cause a crack sooner between the old cementing mixture and the new. This is not helpful, but the worse is how a bad re-cementing job diminishes the look of the windows. When the cement mixture is not thoroughly removed, it stays caked on the glass creating a black shadow from the inside. On the outside, there are all these white area of set up cementing mixture. The beauty of the glass is ruined. It is very difficult to clean once a bad re-cementing job is applied. This is photo of a leaded window being sealed with the cementing mixture. Note how the putty is hand-worked into the window. Close-up view from the outside of a window that Laws Stained Glass installed in 1958. This picture was taken in 2012. These windows were not covered with protective covering and did not leak. Note the quality of the lead and the cementing after 54 years! Close-up of the same window installed in 1958 from the inside at Mocks United Methodist Church in Advance, NC. Note the quality of the lead and the cementing after 54 years! At First Presbyterian Church in Belmont, NC, Laws' workers are re-cementing a window. This is a close-up of the same window to the right. Note how the cementing mixture is smeared over the lead joints before the excess is removed. This is a photo after the excess cementing mixture has been removed and the window has been cleaned on the outside. This is a thoroughly cleaned window that has been re-cemented. Close-up showing a re-cementing job done by another company. Note how the excess cementing mixture was not removed. BEFORE - In this close-up, the excess cementing mixture was not even removed from the smaller pieces of glass. BEFORE - Note how the cementing mixture was only halfheartedly removed from the glass with the texture. Now it is nearly impossible to scrape it off because it is stuck to the glass and set up like concrete. AFTER - This is the same window as in the two previous photos after Laws' workers had cleaned it.